ELLENTON, Fla., (August 24, 2018) - Feld Entertainment, Inc., revealed today new track features for this year''s Monster Energy Cup, the sport''s largest invite-only Supercross race on October 13 at Sam Boyd Stadium in Las Vegas. In its eighth year, the 2018 Monster Energy Cup, which posts a $250,000 purse and a potential $1 Million bonus awarded to the winner of all three 10-Lap Main Events, returns to Las Vegas for a stellar spectacle of the world''s top two-wheeled professionals under the bright lights of one of America''s liveliest destinations. This year, the track will feature dual Monster Energy Cup arches that will rise from the track into the grandstands, plus dual sand sections, dual over-under bridges and the return of the Joker Lane, which will once again be a slower disadvantage that athletes will have to race through at least once during each Main Event. As in year''s past, the track will take full advantage of the stadium''s layout by sprawling into the parking lot and paddock area. Racers will scream back into the stadium at full speed hitting upward of 75 mph as Monster Alley stretches an impressive 1,114 feet in length. To make capturing the Monster Million as challenging as possible for athletes and more entertaining to watch for fans, this year''s unique hybrid track design inspired by five-time Monster Energy Supercross Champion, Ricky Carmichael, will be unlike any other stadium race in the world with a combination of traditional supercross elements and outdoor, natural-terrain stylings. 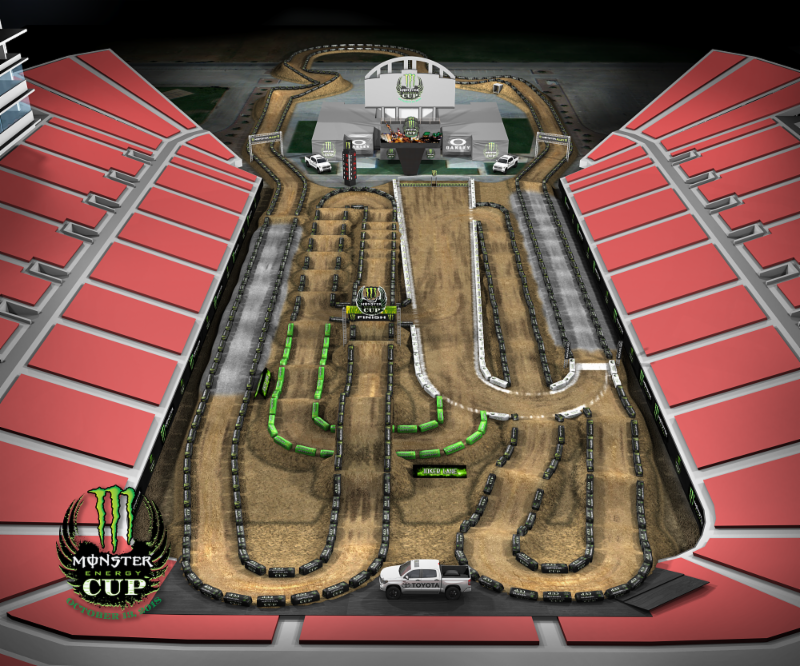 "The Monster Energy Cup is always the place where we try to outdo ourselves, from the highest start in history to building sections of the track that traverse into the stands, we''re always trying to push the limits of track design," said Dave Prater, Senior Director of Operations - Two Wheel, Feld Entertainment. "We had a great 2018 Supercross season showcasing these athletes and this is our time of year where we can have fun and do never-before type things. We love coming here to Las Vegas with another million dollars to celebrate the sport''s marquee athletes, and this year''s Monster Millions promotion adds even more excitement for the fans." The Monster Millions Sweepstakes is the biggest consumer promotion in the event''s history. Ten lucky winners will receive a grand prize trip to Las Vegas, VIP tickets to the event and a $1,000 grab-for-cash contest during the evening''s festivities. In front of an exuberant crowd, the contestant who collects the most cash also becomes eligible to win a bonus $1 Million if one of the racers also wins $1 Million by winning all three Main Events. No small feat, but certainly possible as Marvin Musquin proved last year. The open Monster Energy Cup Class format pits competitors against each other on 250cc and 450cc machines and offers racers the option to choose the bike of their choice. Athletes expected to race include reigning Supercross Champion Jason Anderson, last year''s $1 Million winner, Marvin Musquin, plus Eli Tomac, Justin Barcia and more. In 2017, Musquin became only the second athlete in the event''s history to capture $1 Million after Ryan Villopoto won the inaugural race in 2011. After finishing the 2018 Monster Energy Supercross season in second place and going down to the wire at the final event in Las Vegas, Musquin could be in the best position to repeat and become the first two-time Monster Energy Cup Champion. Along with the world''s best professional two-wheeled athletes in attendance, the Monster Energy Cup will feature the Supermini and Amateur All-Star classes for top athletes ages 12-15 who have earned the right to compete on the same track as the stars of Supercross as they prepare themselves for the next step in their racing careers. The Monster Energy Cup is an annual showcase of the world''s top Supercross athletes in a one-night-only battle for the coveted Monster Energy Cup trophy and the shot at winning $1 million, the largest prize in motorcycle racing. Unlike any other race, the Monster Energy Cup challenges racers in their fight for victory with three, 10-Lap Main Events on a custom-designed track, inspired by 5-time Monster Energy Supercross Champion Ricky Carmichael. The Monster Energy Cup posts a $250,000 purse, with the winner guaranteed to walk away with a $100,000 check, and any rider who wins all three Main Events will take home $1 million. Feld Entertainment® is the worldwide leader in producing and presenting live touring family entertainment experiences that bring people together and uplift the human spirit. Properties include Monster Jam®, Monster Energy Supercross, Disney On Ice, Disney Live!, Marvel Universe LIVE!, Sesame Street Live!, DreamWorks Trolls The Experience (coming Fall 2018) and Jurassic Live: The Real Dinosaurs™(coming Fall 2019). Across the brand portfolio, Feld Entertainment has entertained millions of families in more than 75 countries and on six continents. Visit feldentertainment.com for more information. Based in Corona, California, Monster Energy is the leading marketer and distributor of energy drinks and alternative beverages. Refusing to acknowledge the traditional, Monster Energy supports the scene and sport. Whether motocross, off-road, NASCAR, MMA, BMX, surf, snowboard, ski, skateboard, or the rock and roll lifestyle, Monster Energy is a brand that believes in authenticity and the core of what its sports, athletes and musicians represent. More than a drink, it''s the way of life lived by athletes, sports, bands, believers and fans. See more about Monster Energy including all of its drinks at monsterenergy.com.